The Law Library has been integral to the Faculty of Law (now known as the Peter A. Allard School of Law) since it was formed in 1945. Since then, while remaining the “heart” of the law school, the Library has developed into an important resource for UBC and for individuals and groups beyond the Point Grey campus. In 1945, George F. Curtis became the first Dean of the UBC Faculty of Law. A great library builder and supporter, Dean Curtis purchased a set of Dominion Law Reports to add to the law library’s rudimentary collection, while travelling to Vancouver. In four short years the library had grown to 12,000 volumes. (source: W. Wesley Pue, Law School: The Story of Legal Education in British Columbia (Vancouver: University of British Columbia Faculty of Law, 1995) at 258 [Pue]. A War Memorial Endowment Fund was established in 1948 by members of the Law Society of British Columbia. In a letter to Angus MacLucas, Bursar at the University, the Treasurer of the Law Society included a cheque in the amount of $3,000 and indicated that interest from the fund was to be used to purchase works on jurisprudence, legal history and political theory for the Law Library (Letter from C.M. O’Brian, Treasurer of the Law Society of British Columbia, April 29, 1948). 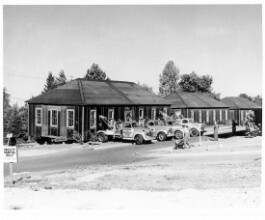 The library was initially housed in a World War II army hut – a temporary structure not really suitable for housing books. Proper space was needed! “In 1948 Leon and Walter Koerner anonymously donated $10,000 to establish a law Library. This figure exactly matched the amount President Klinck had determined was necessary to create a quality university law library”. (Quote from Dean George Curtis in Pue at 257). 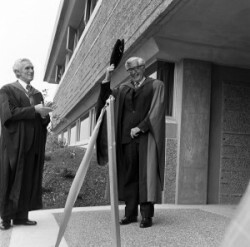 In 1951, a new law building opened its doors. Distinguished visitors to the new building included Louis St. Laurent, the Prime Minister of Canada; Gordon McGregor Sloan, Chief Justice of B.C. ; Sherwood Lett, Chancellor of the University; Dr. Norman MacKenzie, University President; and many notable members of the Bench and Bar. The new building also included a larger library, with the capacity to house a growing collection of approximately thirty thousand books. 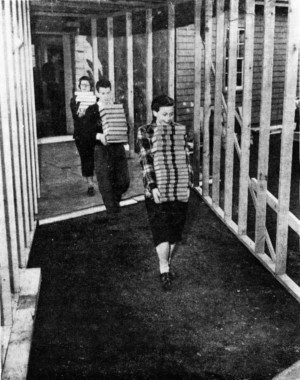 “The students… organized a work gang to ferry books over to the new building” and “the move was completed in a single day.” (Pue at 258). In 1950-51 the budget for the Law Library was $8,792. Expenses included: $947 for textbooks; $2,400 for subscriptions to reports and periodicals; $1,097 for binding costs; $4,148 for new sets; and $200 for postage. (Letter to Dean C.A. Wright, University of Toronto School of Law, from Dean Curtis, October 23, 1951). 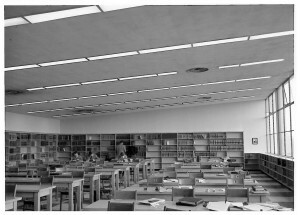 Memos and correspondence from the early 1950s indicate that the library was viewed as the law school’s “laboratory”; a separate entity under the administration of the law school, rather than as a branch of the university library system. If great legal research was to be conducted by the students, they needed their “implements” close at hand. This view was shared by a number of law deans and faculty members from other Canadian and American law schools, in the early years. In an article published in a 1952 issue of The Advocate, E.A. Lucas vividly underscores the importance of the law library with the following words: “The Law is in the Books. The library is the blood circulation, as it were, in the body of this school….” (E.A. Lucas, “The Law Building” (1952) 10 The Advocate 133 at 134). An agreement was made to formally transfer a number of legal titles from the Main Library to the Law Library. Prior to the letter, the books had been on loan to the Law Library. The relevant cards in the Main Library’s public catalogue were updated and stamped ‘Law Library’, to indicate the permanent location of the books. (Letter from Neal Harlow, University Librarian, to Dean Curtis, May 22, 1953). Diana Priestly, 1956. The Faculty of Law's first Law Librarian. In 1953, Diana M. Priestly was hired as the Faculty of Law’s first Law Librarian and a Lecturer in the Faculty. In 1946, she had enrolled in the Special Veteran’s Class at the UBC Faculty of Law, and after graduation, had articled and practiced law with the Nanaimo law firm of Leighton, Meakin and Weir. She subsequently pursued graduate studies at the University of Washington where she obtained a Master of Law Librarianship degree, before returning to UBC in 1953. During her term of appointment, the law library collection flourished in size, growing to approximately 60,000 volumes. 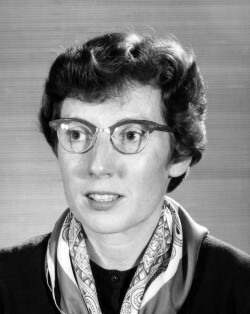 Diana Priestly held the position for ten years before leaving to accept a position at the University of Toronto, in late 1963. In 1957-58, the budget for the law library was $12,750. Expenses included: $3,615 for subscriptions to law reports; $659 for subscriptions to journals; $1,200 for an honorarium to student desk attendants, $3,120 for textbooks, and $350 for “wages for help during summer”. In her letter to the Dean, the Law Librarian, Diana Priestly, indicated that next year she hoped to purchase a second set of the Canadian Abridgment, which would cost $500. (Letter from Diana Priestly, November 28, 1958). “By the early ‘60s … the three original lecture halls (originally lined with books) had been overtaken by the collection itself…. By this time the collection had grown to 60,000 volumes, the student body was approaching 550 in number and the ‘new’ law building was clearly proving to be woefully lacking in space for all of its teaching and most of its library functions”. (Report entitled The U.B.C. Law Library: An Overview by T.J. Shorthouse, December 1, 1989) [Shorthouse]. In an internal memo dated December 1963, Professor Ray Herbert outlined a plan for operating the library on the departure of Diana Priestly, who had accepted a new position at the University of Toronto. 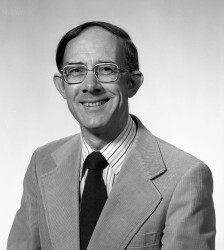 Professor Leon Getz was in charge of the library, assisted by a committee of faculty members which included Professors J.C. Smith, Eric Todd and Ken Lysyk. 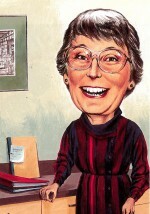 In January 1964, Doreen Dowd (later Ingram) was assigned by the Main Library as a half-time librarian at the Law Library. Later in the year, she became the full-time Law Librarian, on an interim basis. (Dean Curtis memo, April 2, 1964). Any book shelved in the main stack area on the western side of the main hall in the library building may be taken out for a period of two weeks, after being checked out. A book is checked out by removing the card which will be found in the inside back cover, writing your name legibly on the card, and writing on the card the date the book is checked out and handing the card to a member of the library staff. Reserved books may be taken out for use for periods of two hours at a time upon request to a member of the library staff, and after filling out the appropriate card in the back of the book. No student may use more than three reports or periodicals at any one time. Members of the student library committee will enforce this rule rigorously and any persistent violators will be reported by that committee to the Faculty for disciplinary action. Tom Shorthouse was appointed Law Librarian in May 1966, succeeding Mrs. Doreen Ingram, who had occupied the position for the two previous years. 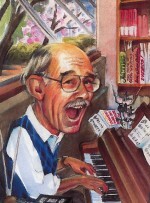 Tom obtained a Bachelor of Arts degree at UBC in 1954, a teaching certificate in 1955, and he subsequently taught high school for several years before returning to UBC and obtaining a Bachelor of Library Science degree in 1965. Tom served as Law Librarian until his retirement in 1998. Tom’s tenure as Law Librarian was an era of great change for the law library and its users. From the early days, when there was no card catalogue and books were shelved in alphabetical order by author, to the development of a strong print collection of monographs, journals and law reports, to the advent of computers and the subsequent development of online legal research resources. Tom’s contributions to the law library and to the entire UBC library system during his term as Law Librarian were significant and many. “For 32 years Tom nurtured and guided the law library to its current position as one of the best in Canada. He has done that with unparalleled excellence and charm.” (Bruce D. Woolley, “On the Front Cover” (1999) 57:4 The Advocate 507. In January 1967, Donna Mackenzie was appointed Assistant Law Librarian. She was responsible for a number of retrospective cataloguing projects in the Law Library, including government publications and United Nations materials. There were now seven permanent staff members in the Law Library - two professional librarians, two at the Library Assistant I level, and one each at the Library Assistant II, III and IV levels. 1968-69 in the Law Library will be remembered for several light-hearted things. It was the year in which, for a time, cheese on rye circulated with Salmond on Torts, family pets became familiar sights in the corridors, and a photocopying machine produced 83,500 paid copies and only once spilled all of its nickels at the feet of an astonished student. (source: T.J. Shorthouse, U.B.C. Faculty of Law, Report of the Librarian 1968-1969 at 1. Book circulation continued to rise. Between September and May of 1968-69, 80,439 volumes circulated - an increase of 34% over the 60,012 of 1967-68, and 70% over that of 1966-67. Tom Shorthouse emphasized the need for an expanded reference service and a comprehensive orientation program in legal bibliography for the growing student body. Up to this point in time, first year students were given an assignment by the Faculty, and the students were then expected to be able to locate and use legal materials by themselves. The Law Librarian mentioned that he had asked library administration in the Main Library to consider hiring one more librarian to implement reference services in the law library for the following year. Report of the Librarian 1968-1969 at 6. The Law Library began a major undertaking in July of 1969 - the classification of its collection. Up to this point in time the collection, nearing 60,000 volumes in size, had been arranged alphabetically by author. The U.B.C. Library elected to use a classification scheme for law libraries devised by Elizabeth Moys. The entire card catalogue was systematically replaced card by card; all books had to be labelled as new cataloguing copy emerged; circulation cards were matched and inserted; and during the summer of 1973, the books were re-shelved by call number. Still remaining, however, were large areas of the collection, which included statutes, law reports, journals and legal digests which had never been catalogued or classified. 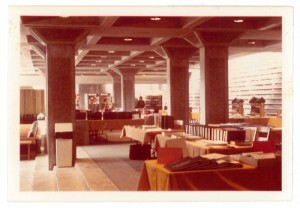 Between 1970 and 1974 doing so became a major focus of library operations. (source: T.J. Shorthouse, The U.B.C. Law Library: Where Do We Stand? : a Report to the Faculty of Law. September 1984 and T.J. Shorthouse, U.B.C. Faculty of Law, Report of the Librarian 1969-1970 at 1-2). Georgia Macrae came to the Law Library from the Main Library during this time-period, and her strong background in cataloguing was put to good use in the classification project. (source: Report of the Librarian 1969-1970 at 8). With the resignation of Donna Mackenzie, Allen Soroka was hired as an Assistant Law Librarian in October 1969, a position that he held for the next 31 years. Prior to arriving at UBC, Mr. Soroka received a law degree from the University of Virginia and a Master of Library Science degree from Columbia University. During his time at the Law Library, Allen supervised the staff working in the Circulation Division, provided reference and research assistance to many users, and offered legal bibliography training to law students and to a number of aspiring law librarians, who were enrolled as students at UBC’s School of Library and Information Science. He was a mentor to many students. 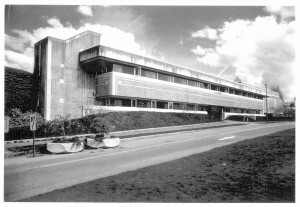 The Law Library (1976), soon after being built was nicknamed "the bunker" for the low amount of natural light and grey exterior. During the 1970s, the Faculty’s Library Committee met on a regular basis. The Committee, which included several faculty members, law library staff and student representatives, discussed wide-ranging issues, from the grouping of study carrels and potential smoking areas in the proposed new law library, to the listing of faculty publications in the library card catalogue, university-wide library budget cuts, Law Foundation grants, and the possibility of turning the storage area on the lower floor of the library into a ‘lounge’ with food and coffee service! Committee minutes from the mid-1970s indicate that George Curtis, as a member of the Library Committee, continued to be a supportive advocate of the Law Library. size of collection – 65,000 volumes; annual law accession rate – 5,000 volumes; importance of housing the law collection separately; composition of law library staff included 3 librarians, 1 cataloguing librarian in the Main Library, 7 full-time non-professional staff, 5 part-time non-professional staff, equivalent to many student assistants hired during the school term; and an estimate of $1,000,000 as the basic financial requirement to establish a new law collection (letter to Chief Librarian, University of Calgary, from T.J. Shorthouse, May 20, 1971). Oh, the 1970s. Fleas - really? At a meeting of the Library Committee in November of 1972, Tom Shorthouse mentioned that library staff members and students were being bitten by fleas while in the library. It was felt that this raised a more general question of the place of dogs in the library building, and it was suggested that the student representatives raise the matter with the Law Students Association. (source: Minutes of a meeting of the Library Committee, 14 November 1972). In January 1975 the Law Library moved into new quarters in the renovated George F. Curtis Faculty of Law building, which also included a section from the 1950s building. A planning document relating to the design phase of the library provided for a book collection of 150,000 volumes, seating for 75% of a proposed student body of 700 and special facilities for browsing and typing! “During five days in January 1975 a work-force of six library staff and thirty-one temporary recruits working in three teams (one assigned to each floor of the new building) moved the 85,000 volumes on book-trucks to their new quarters”. Shorthouse at 3. Mary Mitchell joined the UBC Law Library in 1978 as Assistant Law Librarian, after gaining valuable experience at the Vancouver law firm of Farris, Vaughan, Wills and Murphy. As one of the Law Library’s two reference librarians, she assisted faculty, students, lawyers, members of the broader university community and the public with their reference and research needs. As well, over the years, she provided legal research sessions for various groups, including introductory legal bibliography sessions for 1st year law students; ‘refresher’ sessions for 2nd and 3rd year students, individual law classes and competitive moot teams, Collection development duties, which included selecting Canadian legal materials, were also components of her work. Beginning in 2010, in conjunction with other Law Librarians, she contributed to the development and teaching of credit-based courses for the first year and upper year legal research and writing program, for the Faculty of Law. The Report of the Library Committee in 1978-79 included information on the installation of a new high-speed computer terminal in the Law Library, with the financial assistance of the Law Foundation of British Columbia. The Library staff used the terminal to conduct 85 searches for students and faculty and 30 searches for practicing lawyers. The era of online computer-based legal research had arrived. The UBC Law Library was also designated an official “service centre” by the Canadian Law Information Council and funding of search costs was provided by CLIC, to educate students, faculty, members of the bar and judiciary on the potential of computerized legal data. During this same time-period, the Law Students Association purchased three typewriters and placed them for student use in an unfinished area on the bottom floor of the Law Library. Clearly, it was a time of transition. Who could foretell the fundamental changes that computers would bring to the world of legal research and writing. Minutes of the Library Committee meeting held on February 19, 1980 indicate that the Faculty of Law received a grant from the Law Foundation of British Columbia to fund a Japanese Law Programme. The continuing economic support provided by the Law Foundation of British Columbia to the UBC Law Library was underscored in a letter from the Law Foundation to Dean Ken Lysyk, dated October 9, 1980. A grant of $186,103 was made to support collection development, including funding for continuing serials commitments and monographs on the history of law, legal process, the regulatory function and the social sciences. A new micro-film reader-printer was also funded from the grant monies. The cost of serials rose from $135,656 in 1981-82 to $178,449 in 1982-83 - an increase of 31%. With funding provided by the Law Foundation, oak and glass cabinets were constructed on the main floor of the Law Library, to house the rare book collection. Law Library staff began a project that would ultimately result in an on-line serials check-in and payment system. Details relating to each serial title were keyed in, in order to activate the serials records. In a 1984 status report on the Law Library, the Law Librarian stated that the major responsibilities of an academic law library were to develop a collection adequate to the teaching and research requirements of the law school and to provide the kinds of services which would enhance its use. Funding for collection development had risen dramatically over the years. In 1964-65 the collection budget stood at $5,700 for monographs and $13,000 for serials (law reports, statutes, journals and loose-leaf services). In 1983-84 the amount of money spent on such materials had risen respectively to $71,000 and $193,759. A daily shelf of current serials was maintained in the Faculty Library, for faculty to scan. This was a popular service. Of 5,500 issues routed for two weeks to this location in 1983, 1,136 resulted in photocopying requests and 473 loans. All cases received from the Supreme Court of Canada and both divisions of the Federal Court were indexed by staff. All cases received from the B.C. County Courts, the Supreme Court and the Court of Appeal were indexed by staff and bound. All bills received from both the federal Parliament and the B.C. Legislative Assembly were organized and indexed. All new books were processed and available for circulation prior to cataloguing. This service, unique to the Law Library, allowed faculty and students to access new materials that would otherwise have been unavailable, until they were catalogued. A consolidated card file of abbreviations for law journals and law reports was maintained. A printout of serial titles and their location in the library was maintained. A current display of newspaper clippings on various legal topics was kept for students and faculty. A copying service was provided to members of the Bar, for materials not available in the Court House collection. (201 photocopies of items were requested and handled by staff in 1983). The reference librarians provided lectures in legal bibliography to law students, students in other faculties, off-campus groups, and to participants in the Law Society’s Professional Legal Training Course. (source: T.J. Shorthouse, The U.B.C. Law Library: Where Do We Stand? : a Report of the Faculty of Law. September 1984). In a report to Heather Keate, Assistant Librarian, Public Services, Tom Shorthouse, the Law Librarian, reported on the ever-increasing costs of serials. In 1984-85, costs rose in each of the following areas: Law Reports - 12%; Journals - 31%; Reference materials - 27%; Statutes - 15%; Loose-leaf services - 29%. The Law Librarian also reported on the completion of a significant 3-year project undertaken by Mary Mitchell, to produce a third edition of Periodicals in Canadian Law Libraries: a Union List, for the Canadian Association of Law Libraries. The resource was housed online at UBC. Plans were underway for contributing libraries to submit updates to the editor, Mary Mitchell, on a regular basis, and for subsequent editions of the resource to be published and distributed locally, to subscribers across Canada. The Law Librarian mentioned that unfinished storage space on the bottom floor of the library would be used to house a growing Japanese law collection. The possibility of expanding the library’s Asian collection to include Chinese law was also raised, as the result of an exchange agreement that had been worked out during the year between the Faculties of Law at U.B.C. and Peking University. Robert Franson, Associate Professor of Law, an early adopter of new technology. Computer use in the Law Library continued to grow in the mid-80s. The reference librarians now had a computer terminal at the information desk, primarily to field questions relating to serials, and the processing staff were paying invoices and checking in serials online. The original six kardex units used for manually checking in serials were now yesterday’s news! (source: T.J. Shorthouse, The Law Library: An Overview of Developments and Problems, 1984-85. September 5, 1985). A computer lab on the bottom floor of the Law Library was now operational. Sponsored by IBM, the room housed 21 PC units, two of which had modems for QL searching, and one printer. The room was accessible only to law students after they had paid fees; either $30 for one term or $50 for a full year. Since each computer had its own key, the Circulation staff members in the Law Library were kept fairly busy distributing keys in exchange for student library cards. The era of personal laptops had not yet arrived! The routing of serials to the Faculty Library on the top floor continued to be a popular service. The Law Librarian reported that 5,819 serial items (journal issues, law reports) were sent to the Faculty Library in 1985, for faculty browsing. 1,064 requests for photocopying ensued, as well as 212 actual loans, which were requested by faculty members after the shelves were cleared. In his report, the Law Librarian provided information on the bibliographic instruction given to various library users during 1985-86. Allen Soroka and Mary Mitchell continued to provide regular bibliographic instruction to first year students at the beginning of the fall term. 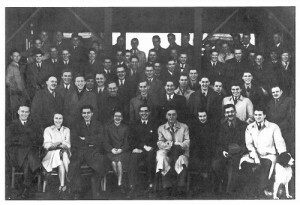 Eight lectures were given, in addition to ‘refresher’ lectures in the spring for graduating students. Special lectures were also scheduled for new students in the graduate program, for medical researchers at UBC, students in environmental studies at Simon Fraser University, students in the Langara court interpreters’ program, and articling students enrolled in the Professional Legal Training Course in downtown Vancouver. (source: T.J. Shorthouse, The Law Library: An Overview of Developments and Problems, 1985-86. September 22, 1986). Tom Shorthouse's 1999 The Advocate cover. Tom Shorthouse reported that a new program in Chinese law, made possible by grants from the Excellence Fund, had resulted in the Law Library acquiring ten new journal titles requested by a newly-appointed faculty member. The Computer Room had a successful first year. Four additional PCs were placed in an open area on the bottom floor of the Law Library; a development that brought about the end of smoking in the library. On a lighter note, the Law Librarian acknowledged writing and performing songs for the 25th anniversaries of both the School of Librarianship and the Canadian Association of Law Libraries, as well as for the 1987 annual conference of the Canadian Library Association. (source: T.J. Shorthouse, The Law Library: An Overview of Developments and Problems, 1986-87. September 4, 1987). The ever-increasing cost of serials continued to be an issue of concern. Between the 1986-87 and 1987-88 reporting periods, the cost of serials rose 19.3% - from $244,862 to $292,363. The Law Librarian reported on a new development in legal publishing. Publishers were beginning to produce monographs in a loose-leaf format, rather than the traditional hardbound editions. In addition to increased subscription costs for the loose-leaf monographs, approximately 35 hours per week of staff time was now spent filing updates. The Law Library routinely ordered and received all monographs and serials directly, so that newly received materials were quickly made accessible to users. All serials entering the Law Library, including unbound issues, bound serial volumes and replacement volumes were fully processed ‘in house’. Of 6,235 volumes entering the division in 1986, 4,148 volumes were processed within five days of their receipt. (source: T.J. Shorthouse, The Law Library: Some Notes on Considerations for Future Planning. November 18, 1987. It was a busy year in Circulation! Staff in the Law Library signed out 33,165 monograph and serial titles from the general collection and an additional 20,142 loans from the reserve collection. A further 60,855 non-circulating volumes were reshelved by the staff during 1988-89. It was clearly a time when legal research and study were still being carried out in a print world. Change, however, was on the way. The Law Librarian reported that in January 1989 a pilot project was instituted by the Law Library and conducted by a third year law student to provide instruction in the use of the Quick Law database. From January to March of 1989, approximately15 students each week received tutorial instruction in conducting computer-based legal research. In 1988-89 there was only one online public access terminal on the main floor of the Law Library. It was very popular with users and it was not unusual to see a lineup of three to four people waiting for their turn to use it. The Law Librarian mentioned that an exchange program had been instituted with the Faculty of Law at Niigata University in Japan in the spring of 1989. A substantial shipment of law journals, law reports and law commission reports had been sent by the Law Library, and a reciprocal donation of Japanese legal materials was anticipated. (source: Tom Shorthouse, The Law Library: An Overview of Developments and Problems, 1988-89. June 8, 1989. In 1989-90 the two reference librarians answered 14,501 questions at the reference desk and an additional 6,696 telephone queries. The reference staff also continued to provide legal bibliography lectures to both on-campus and off-campus users. The sessions ranged from four introductory research sessions for first year law students to session for students from the Faculty of Commerce and community colleges. Advanced-level classes were offered to library school students and those in the LLM and legal clinic programs. Of the 21 computer work-stations in the Computer Lab on the bottom floor of the Law Library, only 4 had a modem connection allowing law students to go online to QL Systems. Due to the lack of hardware, many of the law students were unfamiliar with computerized legal research and relied on the reference librarians for assistance. As in the previous year, an upper-year law student was hired to conduct ‘hands-on’ training and tutorial sessions, ten hours each week, for interested students. Technological advances in the Law Library continued. For the first time, LegalTrac, a CD-ROM version of Current Law Index, a major legal periodical index, was offered on a trial basis in the Law Library. It proved to be user-friendly and popular with both faculty and students. In August of 1990, a casual reading space re-named the “Inner Temple” was created out of a former audio/visual room on the main floor of the library. Furnished with soft-chairs and reading lamps, it became a bit of a haven for students wanting a quiet place to read newspapers and popular magazines that had been donated. The Law Library spent $460,612 on collections in the 1990-91 budget year, of which $366,978 (79.67%) was spent on serials of all kinds. On a lighter note, Christmas marked the first annual “Christmas Carrel Contest” in the library. Students made a pledge to the Empty Stocking Fund and decorated their carrels for a potential prize as the most imaginative. About four years ago, the faculty wing and the Law Library were wired for a proposed Faculty of Law mainframe hookup, which would handle both in-house and external data and provide for word-processing and messaging functions. The hookup was now operational, and, for the first time, the faculty had access to UBCLIB, the library’s online catalogue, in their offices. During this time period, the library received two surplus IBM-XTs from the Faculty of Law, which meant that all three librarians now had workstations in their offices. Many ways to have a good time! And there’s lots there for you to do! You can do as you darn well please! But be sure to keep on ACT-ING! Law’s the right place for you to be! There’s so much there for you to do! Ranch in the Fraser Valley by A.Y. Jackson is donated to the law library by Mr. and Mrs. Thomas and Margurite Duckworth in honour of the MBA LLB Class of 1951. Oil on canvas, 63.5 x 81.3 cm. A.Y. (Alexander Young) Jackson (1882-1974) is one of the founding members of the Group of Seven (1920-1931) and one of Canada's most celebrated twentieth century artists. Jackson made regular sketching trips to Quebec in the spring and traveled to the far regions of Canada during the summer. In the fall he would return to the Studio Building in Toronto where he lived until 1955, spending winters painting canvases. He continued this active lifestyle until he was in his eightys. Rich in colour with soft, blunted, and rounded forms, Ranch in the Fraser Valley, c.1948-1953, rolls with an easy, deep rhythm that is Jackson's trademark. A.Y. Jackson's work is found in every major collection of Canadian painting. Curtis, George, Letter to Dean C.A. Wright, University of Toronto School of Law, October 23, 1951. Curtis, George, Letter to University President Norman MacKenzie, January 10, 1952. Harlow, Neal, Letter from University Librarian to Dean Curtis, May 22, 1953. Lucas, E.A., “The Law Building” (1952) 10 The Advocate 133. O’Brian, C.M., Letter from Treasurer of the Law Society of British Columbia, April 29, 1948. Pue, W. Wesley, Law School: The Story of Legal Education in British Columbia (Vancouver: University of British Columbia Faculty of Law, 1995). L.R.R., “On the Front Cover” (1987) 45:3 The Advocate 333.